The Outer Material Is Oxford Textile And The Inside Materials Foamed Plastic. 3m-Reflection Strips And Common Ones. 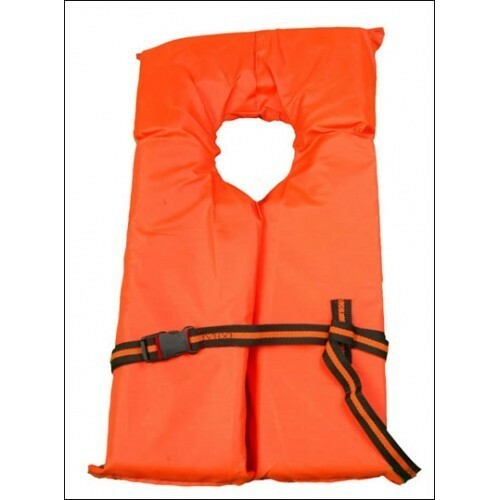 Children Life Jackets Also Can Be Supplied. Shiva Industries is a well reputed organisation dealing with the manufacturing and supplying of Industrial Safety Clothing, Safety Shoes, Disposable Wear, Safety Shoes, Safety Shoes High Ankle, Sports Safety Shoes, Body Protection Products, Fire Control Items, Gumboot, Smart Safety Shoes, Caterpillar type Safety Shoes, Branded Shoes, Hand Gloves, General Safety Products Respirator Masks, Eye Ear Protection, Head Fall Protection, Tapes, Posters & Stickers, Swimming Accessories, Safety Boots, Welding Accessories & Electrodes, Food Storage Bucket, Road Safety Items, Antistatic Products, Antistatic Wears, Road Safety Barricades, Heat Resistance Safety Shoes, Traffic cones, Traffic Batons Light, Lockout Tagout Kit, White Safety Shoes, Road Safety Products, without Laces Safety Shoes, Medical Eyeware, Gama Eyeware, Divider Cone, Solar Safety Cone, Solar Cone, Vehicle Tape, PA System, Solar Light, Safety Net, Hoses, Cryogenic, Safety Boots, Disposable Products and other safety accessories. With excellent quality, effective performance and cost competency these products are highly demanded in various constructional industries, nuclear plants, chemical engineering sites, hospitals and many more. With a rich experience of 21 years we are capable of producing qualitative range of finished products in a bulk and deliver them at stipulated time. Made of premium quality raw materials our offered range is available in various dimensions and specifications. With an option of customisation our products are available in industry leading price. We design and produce our products in a way to provide utmost protection to the wearers from various unwanted damages and hazards incurred while working in industrial sites. With the support of our team of experts and engineering professionals we are capable of generating exclusive range of products and cater them to various parts over the country.